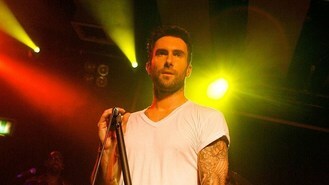 Maroon 5 frontman Adam Levine has apologised to fans after the band postponed their UK dates. The group were originally set to play five dates at arenas in Glasgow, Birmingham, London and Manchester in June, but due to "unforeseen scheduling conflicts", have now rescheduled them for January 2014. Lead singer Adam, who is a judge on The Voice USA, said in a statement: "We are truly sorry for any inconvenience we have caused our fans and promise that when we come over in January we will put on a show to remember! We can't wait to play in the UK again." Tickets for the original dates will be valid for the new dates, although full refunds are also available. Maroon 5 will be supported by Canadian star Robin Thicke and Maroon 5's keyboardist PJ Morton, who will open the shows with his solo material. Madonna is set to be a guest presenter at the Sound Of Change charity concert in London. Carole King isn't done with music - not yet anyway. Sir Mick Jagger has revealed that he is planning to make a weekend of it when he headlines Glastonbury with The Rolling Stones and will hang out with his children. Eminem's song publisher is suing Facebook and an ad agency, saying they copied music from one of the rapper's songs. Daft Punk claim fans would be disappointed if they saw what the musicians really looked like. Sir Elton John, Kinks star Ray Davies and Elvis Costello will top the bill at a new outdoor summer festival in London's Hyde Park. Unreleased recordings from the first ever recording session by punk pioneers The Clash are to finally see the light of day. Little Boots reckons she could be the UK's Eurovision remedy. Ray Manzarek, the keyboardist who was a founding member of The Doors, has died. He was 74.